Mount Inabnit is one of the hardest peaks to access in the heart of the Beartooth Mountains in Montana. Having an elevation of 11,924 feet, it is just shy of being one of the 12ers in the state however this peak is just as difficult to access, if not more difficult. This peak has about 500 feet of clean prominence to its parent, Bowback Mountain. Named after Fred Inabnit who pioneered and explored much of the Beartooth Mountains, and is the creator of the Inabnit Map which is on display at the Museum of the Beartooths in Columbus. First displayed in Billings in April, 1926, this map was hand crafted to show the topography of the Beartooth, Absaroka, and Teton mountain ranges and was the first map of its kind for the area. Inabnit also was a huge part of pioneering the first ascent of Granite Peak. Numerous attempts beginning in 1889 failed to reach the top due to poor weather and dangerous terrain. Inabnit made his first attempt in 1910, and led a group of five in 1922, failing both times. On his 1922 attempt, the party turned back merely 300 feet from the summit. He was part of the first ascent party in August 1923 however he did not reach the summit with his climbing partners due to attempting a different route on the south side of the mountain. The next year he attempted but was turned back by terrible fog. 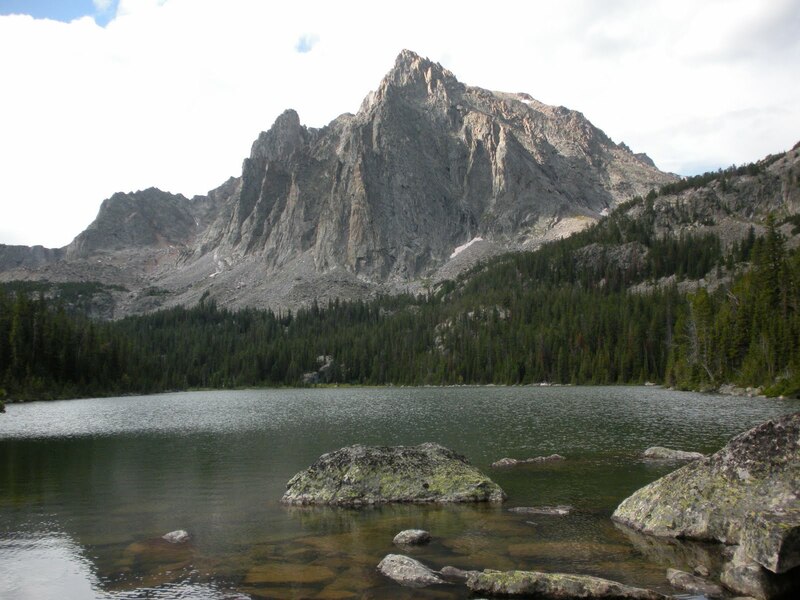 In the summer of 1926, now an aging man, he was on his annual trip to Goose Lake above Cooke City and stumbled upon Norman Clyde with the Sierra Club who was intrigued by Granite Peak. Unable to keep up with Clyde and his friend Ernest Vogel, he once again failed to reach the top. Unfortunately, Inabnit died 2 years later, never reaching the majestic summit. A memorial plaque and ceremony was held in August 1929, at East Rosebud Lake and the plaque was hauled 3 miles up to Snow Lakes at the base of the peak now bearing his name. Close friends of Inabnit bolted the plaque into a large rock at the lower lake. More recently, in 2009, the plaque was found dislodged from the boulder and carried down back to East Rosebud Lake. A rededication ceremony took place in August 2010 and the plaque was refurbished and is now located at the East Rosebud Trailhead. Today, Mount Inabnit is rarely visited and the only evidence that people have once stood on this peak is a small cairn. I would feel confident to say this peak has only a few ascent parties per year. There is no easy way to get to it and once you are near it, there is certainly going to be some snow climbing and much talus to hike over. If you decide to embark on a climb of Mount Inabnit, come prepared with extra food and a sense of adventure. There are a few ways one can approach this peak. I will describe the one I believe to be the shortest and easiest first which starts from the East Rosebud Trailhead. From the MT 308 and US 212 junction at the south end of Red Lodge, head north on US Highway 212 for 1.5 miles and turn left onto MT State Highway 78. After 19.7 miles reach Roscoe and make a sharp left onto East Rosebud Road and measure from this point. After 0.2 mile, pass by the Grizzly Bar and restaurant and continue another 2.4 miles where the road turns to gravel. At mile 3.7, make a left onto the East Rosebud Lake Road and quickly cross East Rosebud Creek on a bridge. Just after the crossing, make a right on East Rosebud Lake Road and cross a cattle guard. At mile 8.3 enter the Custer National Forest where the road becomes paved again and now becomes FS Road 2177. Pass the Jimmy Joe Campground at mile 11.9 where it turns to dirt once again. Pass the Phantom Creek trailhead at mile 13.6 and continue another mile to the East Rosebud trailhead where the road ends at 6,250 feet elevation with ample parking. Begin hiking up the trail as it heads above some cabins along East Rosebud Lake. After 2.5 miles on the trail at an elevation of 6,670 feet leave the trail and head left (SE) through the burn area aiming for the valley coming down from the north. Be sure to leave the trail about a tenth of a mile before it crosses Snow Creek. Make your way up through a barrage of dead logs, talus and bushes for 0.4 mile to 7,100 feet where the slope steepens. Begin heading straight up the steeper slope which is exposed to the heat of the sun until you reach a small ridge above Snow Creek overlooking a 100 foot waterfall at 7,640 feet. Continue up this ridge towards the base of a large cliff and cut right and begin an ascending traverse around 8,000 feet. Traverse up through sparse trees and a lot of talus southward and above Snow Creek. Reach the creek side around 8,300 feet which is 3/4 mile from where you left the trail and follow it a short ways. Then ascend left above the creek and around the forest to avoid bush whacking. At 9,000 feet enter a small drainage and hike up meadows for 100 feet or so, then when you see Lower Snow Lake to your right, continue around it on its east side and about 50 feet above. Cross a small stream coming from the east at 9,200 feet and continue through open trees a short ways to the Upper Lake. Descend to it and walk on grass around its east side to the inlet stream which is 3 miles from where you left the trail. The area around Snow Lakes offers a bunch of great camp spots. This approach is often regarded as a horrible hike from hell worthy of only two words..."stay right"
Although I have not yet done it, I will describe it briefly here. Start at the East Rosebud Trailhead and hike the very nice trail to the far end of Rainbow Lake (great camping) and consider your future. You will have to hike up Whirlpool Creek which drains into Rainbow Lake at its southwest edge. Getting to the mouth of Whirlpool Creek just may be the hardest part because you will have to ford East Rosebud Creek (Impossible through June) and bushwhack around the south side of the lake through thick forest and marsh. Just before the mouth of Whirlpool Creek, hike through bushes and stay on the RIGHT side of the creek on talus instead of the left side where the bushwhacking might be impossible. After a couple miles up Whirlpool Creek, turn left and climb up a side drainage towards Elephant Lake with very good camping. You can then reach Mount Inabnit by continuing straight up the valley passing Lake Susanne and reaching the Bowback/Inabnit saddle by a steep, loose south facing talus slope that always melts our sooner than its corresponding north side which the standard Approach 1 comes in from. From the inlet stream at Upper Snow Lake (Elev. 9,275 feet), do not cross it but instead follow along its south side up a short steep section through trees to 9,500 where the terrain mellows considerably. Hike 0.4 mile east over flat terrain through sparse trees and meadows to a side stream at 9,600 feet which you can easily cross. Continue through beautiful meadows along the left side of Snow Creek and avoid any willows by following inside the heavily braided creek which allows easy walking on rocks. At 9,860 feet, the terrain becomes flat; continue a short ways now on the creeks' right side to the high tarn at 9,925 feet which is 1 mile from Upper Snow Lake. This tarn has some of the best camping around! Go around the west side of this small tarn and reach the end of the meadows at 10,000 feet where you begin climbing talus. 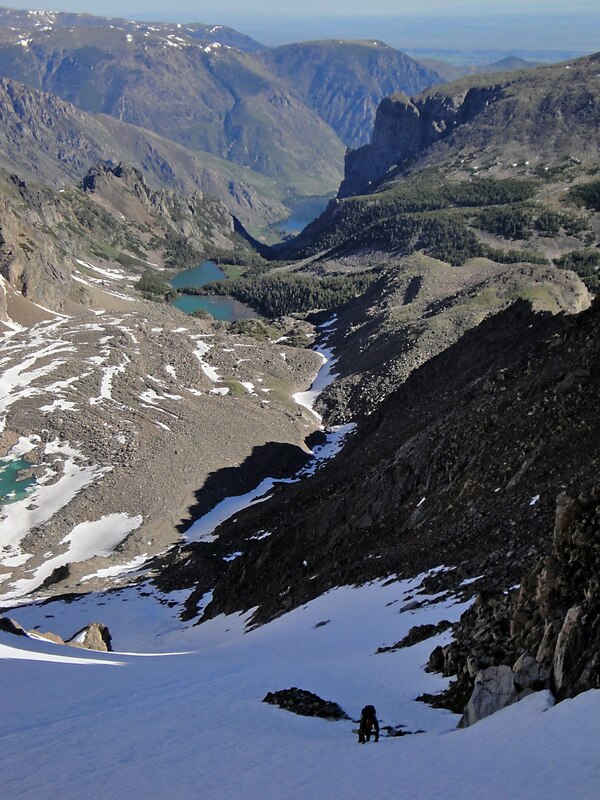 At 10,200 feet reach the base of the permement snowfield and climb easy snow to 10,900 feet staying on the left side. Here the slope gradually steepens to about 40 degrees. Pass to the left of a small crack at 11,000 feet (easily solod), and continue to the Bowback/Inabnit saddle at 11,475 feet. The top of the snowfield may have a cornice and or some ice to work around to either side of on some loose Class 2-3 rock. From the saddle you now have a commanding view of some of the most remote areas in the Beartooth Mountains. Castle Rock Spire, Snowbank Mountain and Point 12,090, including the "Gone Again Couloir" can be seen. The green colored lake down below the saddle to the south is Lake Susanne. Since you make all the work to get to the saddle between these peaks, you might as well put in some extra effort to also climb Bowback Mountain while you are here. From the summit of Inabnit, descend 0.35 mile on the east ridge back to the 11,475 foot saddle, then ascend the west ridge of Bowback Mountain which is a simple Class 2 talus hike. 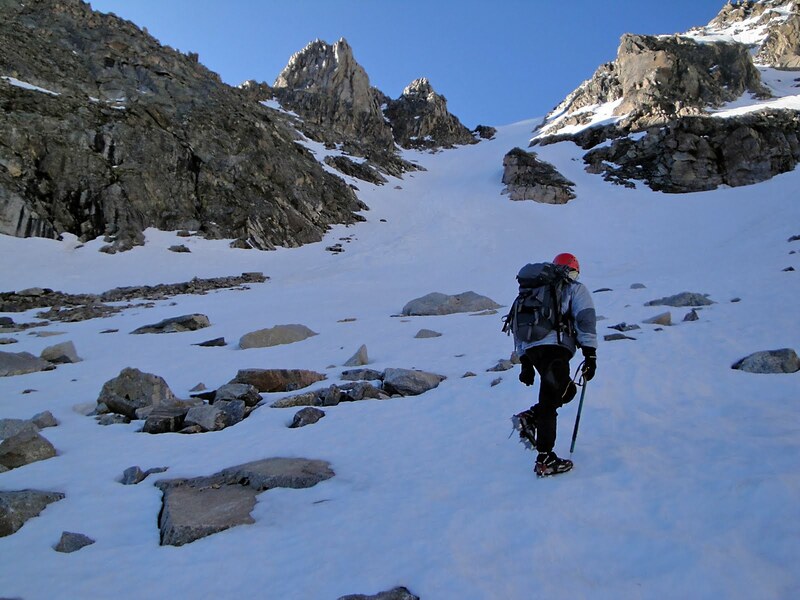 The west ridge takes you to the 12,345 foot false summit of Bowback Mountain at which point you drop 60 feet to the saddle connecting it to the main summit (Class 2). Bypass the remaining difficulties of the ridge to the right (west) side and pass below the summit cliffs. Turn sharply left (east) and climb 100 feet up talus to the summit (Class 2). The traverse between the false and true summits is 0.15 mile. I have not done this route but I know it is very similar to the East Ridge route. Instead of continuing up the main Snow Creek Valley towards the upper tarn, cross the inlet stream at Upper Snow Lake and ascend very loose talus for 800 feet to a high basin filled with loose talus at 10,000 feet (best done in May or June). Continue south to the base of the permanent snowfield on the northwest side of Mount Inabnit and ascend it directly to the lower west peak of Inabnit. The final 400 feet is steeper than the snowfield described for the east ridge above...maybe 45 degrees but still very manageable. From the west peak, descend about 100 feet on Class 2 talus eastward working your way around the south side of a couple small points. The final bit to the summit is an easy 150 foot rock hop. See this page for a brief report about this route. North Ridge Direct - This route is also approached via Snow Lakes but ascends the north ridge directly to the summit of Mount Inabnit. I have not seen a reported ascent of this route but it sure looked like a fun route. There is a steep wall marking the beginning of the ridge just south of Point 10,734 which appeared mid-5th class. The rest of the ridge looked like a serious scramble with many towers to climb over/around. 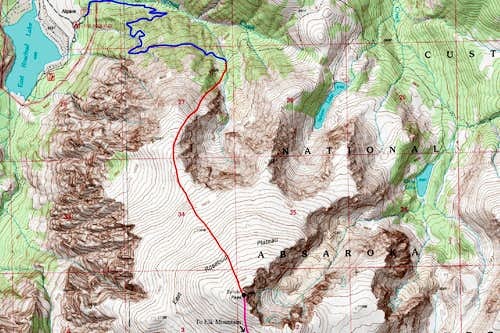 Shown below is a map of Mount Inabnit and the routes of ascent. There is great camping at either of the Snow Lakes or any of the meadows above them to 10,000 feet when the meadows end. Another nice place would be Elephant Lake on the second approach option. Camping is also available at the East Rosebud campground. This area is within the Abasorka-Beartooth Wilderness therefore no motorized travel, including but not limited to, cars, motorcycles, bicycles, hang gliders, airplanes, scooters, etc... is allowed. Please practice leave no trace practices and do not disturb wildlife. You are in grizzly bear country here so always carry bear spray, or a gun, or both for protection only if you are attacked. Report any bears you may have killed or injured to a ranger as a result of any defenses you may have taken. There is a ranger office right at the junction of US Highway 212 and the West Fork Road at the southern end of Red Lodge. Sylvan Peak stands proudly as the first peak you see when driving into the East Rosebud drainage. At 11,935 feet in elevation, it falls just short of having the 12er designation. The summit of Sylvan Peak is hardly talked about however as all the glory goes to the endless granite cliffs and walls flanking just about every side of the peak. To the west, the East Rosebud Plateau drops very steeply into the East Rosebud drainage. These walls offer some great trad climbing opportunities as well as challenging aid climbs. On the east side it drops into Hellroaring Creek where Crow lake is located. This creek drains into East Rosebud Creek downstream of the trailheads. The only real easy ways to reach Sylvan Peak are from the north or the south. The Sylvan Peak Mountain Shop in Red Lodge is named after the peak and is a fantastic place meet some local Beartooth Mountain climbers. 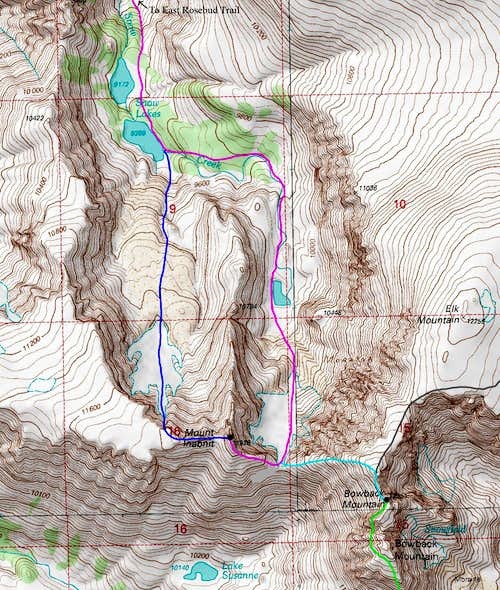 I will describe the easiest route up Sylvan Peak here which is accessed via the East Rosebud Trailhead. There are a handful of very difficult rock climbing routes on the faces surrounding the peak but until I do any of them, I cannot say much about them. Begin hiking up the East Rosebud/Senia Trail as it ascends along Spread Creek until 6,900 feet elevation. The trail then starts a series of 8 long but mellow grade switchbacks as it climbs high above Spread Creek. At about 8,500 feet, three miles from the trailhead, the trail crosses the south fork of Spread Creek on a few placed logs. Instead of crossing the creek, leave the trail and follow the creek up to 8,600 feet, then bushwhack a bit towards the southwest to the start of a large burn area at 8,700 feet. Shortly beyond is a flat bench to hike across and begin hiking steeply up through the burn area in a SW direction. Continue up and begin veering left. You will emerge above the last of the burned trees at 9,400 feet, and reach treeline at 9,800 feet, 0.7 mile from the trail. Continue south up the hill another 0.8 miles as the slope gradually mellows and reach a flat bench at 10,500 feet with a couple 30 foot rock outcroppings nearby. Beyond this point you are fully exposed to the elements for the remaining 1.4 mile hike to the south and southeast up the gentle plateau to the summit. In summer the plateau is filled with beautiful wildflowers to enjoy. This peak can be climbed any time of year but early summer may be the best so you can enjoy these wildflowers. Watch our for the afternoon thunderstorms though. Winter brings lots and lots of cold and wind on the plateaus. This climb is best done as a day hike since there are no good camping opportunities on the route itself. Camping is available at the East Rosebud campground right next to the trailhead however this does have a fee. This area is within the Abasorka-Beartooth Wilderness therefore no motorized travel, including but not limited to, cars, motorcycles, bicycles, hang gliders, airplanes, scooters, etc... is allowed.